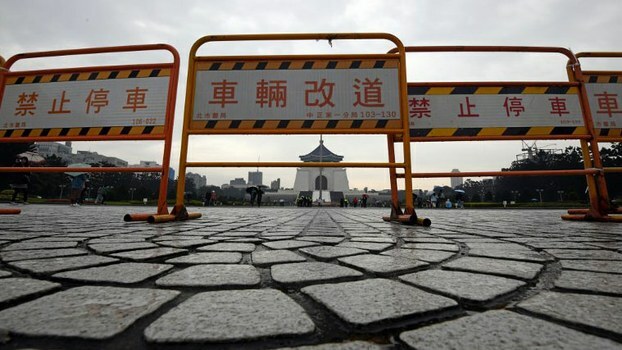 Chiang Kai-shek's Tomb Splattered With Red Paint As Taiwan Marks Massacre - Integration Through Media ....! Protest organizer Cheng Ching-hwa said families of victims say they still don’t have details of what happened to their loved ones, amid growing calls for the removal of Chiang’s statue and image from public places in the now democratic island. The KMT government, which relocated entirely to Taiwan in 1949 after losing a civil war to Mao Zedong’s communists on the mainland, kept records of the era secret throughout its rule. Taiwan defense ministry spokesman Chen Chung-chi called on the public to remain “calm and rational” on the 71st anniversary of the massacre, the island’s Central News Agency reported. But a pro-independence group of people calling itself “From Ethos to Nations” has claimed responsibility for the act, posting photos of the act of vandalism on a Facebook page, it said. “True transitional justice will never happen as long as national resources continue to be dedicated to memorializing the Chiang family,” it said. “Even 71 years later, the truth about the 2.28 incident will still be revealed,” Tsai said in a speech later posted to her Facebook page. “In the past year, with the combined efforts of the National Archives, the Academia Sinica and the 2.28 Memorial Foundation, we have found details of more than 1,000 likely victims in government files,” she said. A 2006 report by the government-funded 2.28 Memorial Foundation found that Chiang Kai-shek bore the main responsibility for the killings, prompting victims’ groups and social activists to call for an end to public veneration of the late Generalissimo. Taiwan had been ruled as a Japanese colony in the 50 years prior to the end of World War II, but was handed back to China as part of Tokyo’s post-war reparation deal. Tsai’s KMT predecessor Ma Ying-jeou said the paint-splattering protest at Chiang’s tomb was “an act of vandalism” that should be limited, and that Chiang Kai-shek had also made hugely positive contributions to Taiwan’s post-war development. “He did a lot to protect and rebuild Taiwan in the post-war era, but as the head of state at the time, of course he bears responsibility for the white terror of the 2.28 massacre and for anything else,” Ma said. Taiwan began a transition to democracy following the death of Chiang’s son, President Chiang Ching-kuo, in January 1988, starting with direct elections to the legislature in the early 1990s and culminating in the first direct election of the island’s president Lee Teng-hui in 1996.